From left to right. . . Persimmons, star fruit, dragon fruit. Avocados are not great here we are looking for a substitute! Maybe dragon fruitamole! I will keep you posted. Persimmon salsa? Star fruit chips! Thanks! I try to be a good sport. It is easy to be adventurous with fruit. Meat is another thing! 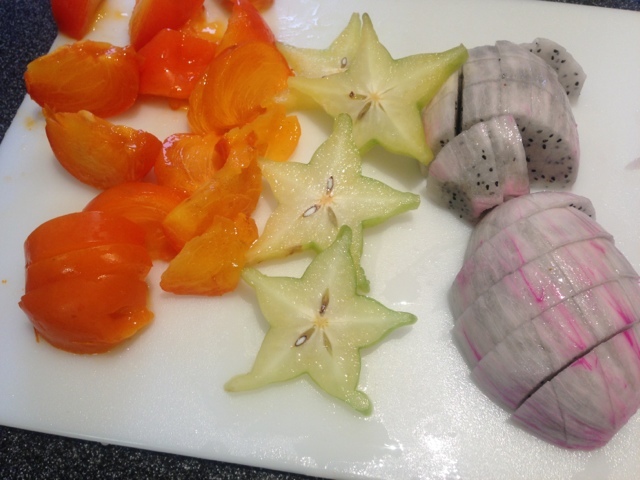 Dragon fruit is pretty but mild like cucumber , star fruit is my favorite kind of a sour pear flavor, persimmon is very sweet. I will post an unpeeled dragon fruit. They are so pretty!